“Fog”: What’s the real amount of government subsidies? Treasury or Pemandu (Idris Jala) figures? “Fixed”: Judiciary judgements that defy our ability to comprehend laws and justice. “Fudge”: Was sports gaming license approved or not? Perhaps it’s just when it will be given? “Frog”: “Funded” leaps to “enlightenment” or just the jumping amphibian? “First Lady”: “constitutional” and “cultural” types, take your pick. “FDI”: Hey guys and gals, we are ok… we will be the chosen destination with our NEM. “Screwed”: Who or what did it? Only our world class experts will know. “Scam”: In Malaysia? You must be kidding. Where got? “Sodomee II”: Something you conjure up after the first attempt failed. “Scholarships”: Our Gov thinks it should be for studies only in Malaysia to prevent brain drain. “Submarines”: Will only dive in tropical waters after extended trials and made only for Malaysia. “Sultan”: Appears in the word for experts used by our world class authorities i.e. Con-sultan. There you are, one for each day of the week. It still defies our understanding that DBKL, an authority that should be delivering the “People First, Performance Now” policies of our most popular PM, should find it hard to grant us the right to a public hearing to allay our fears that our lives and homes are not at risk in their consideration of application to build homes on unstable and steep hill slopes of Bukit Gasing. If DBKL is transparent and acting in accordance with the law, why do they withhold information from us and are unwilling to provide any details on their con-sultan’s and ex-pert’s report that supported Gasing Meridian Sdn Bhd’s proposed development on the steep hill slopes of Bukit Gasing? Why would DBKL not provide evidence of the many departmental approvals that were supposed to have been obtained? Gasing Meridian had not found it commercially viable to proceed with a 2 staged approval process required by DBKL back in 1999 for development of 82 bungalow lots. Gasing Meridian was so upset that they sued the then Mayor of DBKL in October 2000 at the High Court but lost. They further appealed to the Court of Appeal and lost again in December 2003. Yet, it now seems DBKL’s approval for Sanctuary Ridge (name of the current proposed development on Bukit Gasing) is commercially viable. Has DBKL suddenly found that the hill slopes of Bukit Gasing have changed and no longer required the same stringent conditions that were applied in 1999? Is it because of the booming property market that it is now commercially viable for Gasing Meridian to build on steep hill slopes of Bukit Gasing when they could not before? Is there such a scarcity of mansions with a view that billionaires are lining up to snap up the 71 bungalows lots now on offer? One of the causes of the Bukit Antarabangsa landslides was attributed to water leaking from water pipes. Along the boundary of the proposed development by Gasing Meridian is a 2 metre diameter water pipe supplying water from a 23 million litre reservoir from the top of Bukit Gasing and next to one of the proposed mansions with a view in Sanctuary Ridge. Steep hill slopes of Bukit Gasing has again and again rebelled against attempts to build on it. They have been featured on this blog. So, why is DBKL unable to understand our concerns and continue to invoke their powers to ignore us? Will the High Court uphold our rights and bring DBKL to account? Do we have to face the anguish similar to that of residents at Medan Damansara (Damansara 21) or Bukit Antarabangsa as in recent times before the authorities would act to protect us from harm? In our country of ”F**…. and S**….”, the risk of justice being denied is a real and present danger. Please come to the KL High Court to stand with us and support us at the Judicial Review hearing if you are able. The hearing should take the full day. We hope that our legal counsels will be given fair opportunity to present our case against DBKL. Gary Yeoh – JAC for Bukit Gasing. 2. The local authorities are quick to absolve themselves of any responsibility, when landslides happen. 3. Safety concerns to human life are the least on their minds. Now contrast the first report with the second (from a tax-payer) and it becomes so clear how self serving governments and their civil servants have become. 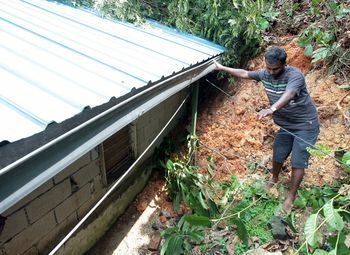 PETALING JAYA (June 3, 2010) : The landslide which damaged the Sri Maha Kaliamman temple at Bukit Gasing on Tuesday was not caused by renovations at the Sivan temple located further uphill, according to a Petaling Jaya City Council (MBPJ) official. Replying to queries from theSun, MBPJ Engineering Department director Cheremi Tarman denied that the landslide was caused by the renovations and attributed it to “natural causes”. “The Sivan temple authorities have spent a lot of money on slope protection so the renovations could not have caused the landslide,” he said. According to a devotee of the Sivan temple, the renovations have been ongoing for about five years. MBPJ Building Supervision Department assistant director II Ismathinoon Abd. Rahman said MBPJ is investigating the landslide. “Our technical staff have visited the site and we are waiting for the report,” Ismathinoon said. He said the department is checking to ascertain if the Sri Maha Kaliamman temple’s construction and extension were approved by the council. Tuesday’s landslide damaged the back portion of the Sri Maha Kaliamman temple which had been recently extended. The extension had been done for safety reasons as the temple was hit by two landslides in 2006. Temple chairman P. Puharasan, 29, appealed to the state government to assist them to find a suitable location to relocate the temple. When contacted, State Executive Councillor for Health, Plantation Workers, Poverty and Caring Government Dr. Xavier Jayakumar said the temple is not registered with the state government. SOMETHING appears to be not quite right in the reactions of various parties to the landslide on Bukit Gasing in Petaling Jaya. MBPJ Engineering Department director Cheremi Tarman is reported to have attributed the landslide to natural causes, “Landslide due to natural causes: Council” (News without borders, June 4). One wonders how he had so quickly come to that conclusion, just a day after the incident. His statement is not congruent with that of MBPJ Building Supervision Department assistant director II Ismathinoon Abd Rahman, who, in the same report, is quoted as saying that MBPJ is still investigating. Even more disturbing is his comment that his department will ascertain if the construction and extension were approved by the council. Tarman’s conviction that the landslide is due to natural causes appears to be based on the fact that the “Sivan temple authorities have spent a lot of money on slope construction.” Surely the director of engineering would know that it is not the quantum of money spent, but the design and conformance to specifications that is of much more importance. I also recall concerns being expressed about the safety aspects and environmental impact issues surrounding the renovations being carried out about a year ago. May I suggest that theSun explore these inconsistencies and perhaps delve a little deeper into the history of the renovations (which is reported to have been going on for the last five years), and whether all statutory and regulatory requirements have been complied with. It may also be interesting to inquire into whether the two spokesmen had any role in the renovation works. This is exactly what we fear – develop an unsafe hillslope and see the disasterous after-effects months or years later. This is an MBPJ foul up. Though there were no approvals, MBPJ looked the other way, since it was a ‘sensitive’ subject. Gods can’t be bribed. But there are no shortages of ‘experts’ willing to certify that the Bukit Gasing development will be safe, when there’s money to be made. Will DBKL and the Developers ever learn? PETALING JAYA (June 1, 2010): A landslide at the Sri Maha Kaliamman temple in Bukit Gasing last night startled some 20 devotees who were in the midst of prayers, but fortunately did not cause any injuries. The landslide, which occurred at 9pm, damaged the back portion of the temple, resulting in the temple committee deciding to close the house of worship until further notice. A temple worker S. Aridharan, 25, told theSun devotees who were sitting on the floor in the main prayer hall when the landslide occurred. A fridge nearby toppled over, narrowly missing the devotees. Sri Maha Kaliamman worker S. Aridharan, 28, shows the area where the landslide occured. 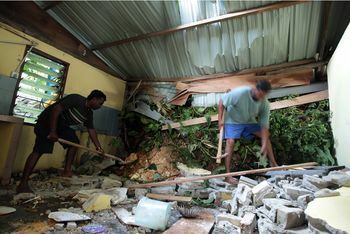 The store room’s zink roof and wall backed by the hill was destroyed by the landslide.Sri Maha Kaliamman temple two workers clean up the debris caused by the landslide. Temple chairman P. Puharasan, 29, said the landslide affected the newly extended section of the temple and damaged the store room. “We spent more than RM200,000 to on the extension and it was supposed to be opened this year,” said Puharasan, who was clearly disheartened by the incident. He said this is the third time a landslide has occurred at the temple in recent years. The temple is backed by a small hill. The first two landslides occurred in 2006 at the old section of the temple. “That is why we extended the temple to make it more safe for the devotees,” he said. “And now, the landslide has occurred at the new section.” He said between 300 and 500 devotees pray at the temple weekly and feared for their safety if more landslides occurred. Puharasan said the temple should be relocated in view of the landslides. “We are appealing to the state government to offer any sort of assistance,” he added. He said he had made several requests to the state government on it, but has not received a reply. When contacted, Bukit Gasing assemblyman Edward Lee said the temple committee has agreed to identify a suitable location for relocation and pledged to assist them. It takes guts, to stand up against the shameless ravaging of the last vestigaes of green. It takes even more dogged determination to find the means for upkeeping such priceless remaining patches of our eco-system. PETALING JAYA: Bukit Gasing has suffered much wear and tear over the years because of the large number of visitors it attracts especially during the weekends. It is estimated that Bukit Gasing receives almost 1,400 visitors during the weekend and 500 on a weekday between morning to late evening. The Petaling Jaya City Council has plans to provide parking facilities, an environmental education centre and public toilets at an estimated cost of RM200,000. There are no parking spots now available for Bukit Gasing visitors. The Petaling District Office has allocated 40ha of land, beside the official residence of Petaling district officer, to be converted into a free parking lot with 81 parking spots for visitors. The big trees will be spared when the piece of land is converted into a car park. The environmental education centre will act as the Bukit Gasing information hub for visitors, especially students. Information on the types of plant, animal and insect species that can be found in the park will be displayed there. Users will need to pay 20 sen per visit to the public toilets which will go towards the toilets’ maintenance. Petaling Jaya environment health officer Mahzura Mohd Amin said vandalism was a problem. “Thieves and drug addicts have stolen aluminum signboards and sold them for cash. The entrance to the park looks run down and broken,” she said. Mahzura said the entrance will soon be blocked with better barricades to prevent motorcyclist from entering Bukit Gasing. The stolen sign boards, broken bridges and worn steps inside Bukit Gasing will be replaced and repaired within three months. The estimated cost for the work is RM150,000. Councillor Derek Fernandez said the council had an allocation of only RM100,000 a year for the maintenance of Bukit Gasing. He said the amount needed to be increased to at least RM500,000. “The Taman Jaya lake gets an allocation of RM500,000 every year for upgrading and maintenance works. Bukit Gasing also has a large number of visitors and we need to maintain this precious green lung. “City Hall must play an active role and care for their side of the hill,” said Fernandez. Fernandez thanked volunteers for their efforts to clean Bukit Gasing. He urged those who visit Bukit Gasing to only leave their footprints behind and nothing else.